Autumn has officially arrived and despite it being depressingly hot outside (still! ), I’m planning the Rancho’s display for my favorite holiday, Halloween. I’ve been knocking around a couple of ideas but have yet to settle on one. So, in the meantime I’ve been entertaining myself by checking out the projects of others online. And I’ve noticed one thing: People love skulls almost as much as they love succulents, and they really love the two together. 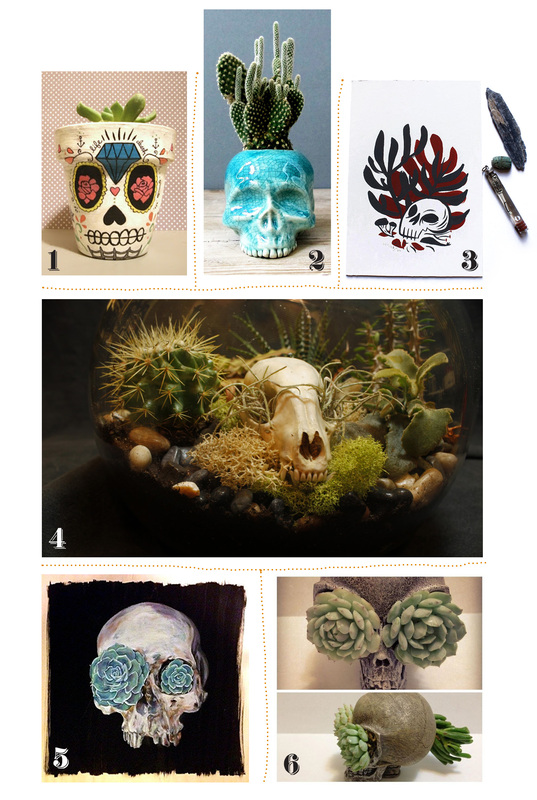 Here are my 6 fave succulent-skull mashups: A terrarium, two paintings, and three planters. Each has the requisite spook factor or panache to either inspire an order, or scare up a project of your own for All Hallows’ Eve. 1. Skull & Succulent Pot: Rozy, of Arizona’s Sincerely Rozy blog, offers this easy how-to for turning a simple clay pot into a Day of the Dead-worthy decoration. Click here to find out how she used common materials to create this fun, inexpensive project. This would be a good one to share with kids. 3. Original Painting by Pam Wishbow: This energetically graphic piece is gouache on illustration board and appropriately titled, ‘Skull with Succulents’; $35. It, and other one-of-a-kind pieces, can be ordered by visiting the artist’s Etsy shop; click here. 4. Custom Terrarium with Raccoon Skull: Created by blogger/artist Crystal Floyd, this scary self-contained world was a gift for a tattoo-artist friend. On her blog, Rummage Vintage and Handmade, she offers to make one for you, too! Contact her by email at xstalfloyd@gmail.com to enquire about pricing (and availability of raccoon skulls). 5. ‘Life in Death’ Blank Greeting Card: A print of a painting by Emily Criscuolo of BlackWolfLeather, this card can be ordered from her Etsy shop for £2.56. Click here to order it and other prints. 6. Found Object Planter; Terrariums by Rick of Park Avenue: Technically not for sale (that I could tell), this terrifyingly beautiful piece is featured on Rick’s Facebook page. He notes that it was found by him “near a crashed weather balloon” … Contact him about availability by clicking here. Have a Halloween decoration or display idea you’d like to share? Send a picture to reubix1@yahoo.com and I’ll post it along with mine in mid-October. Hmmmm… I’ll have to come by and see what you come up with. I didn’t realize that you liked to decorate. I don’t consider myself a skull fan but I love these! Hi, Loree … Big skull fan here; adding succulents just makes them perfect … in fact. I think I have to have the crackled turquoise one from Mudpuppy. I’m a big skull fan as well (both as far as my personal cranium is concerned and for decoration 🙂 When my uncle sluggo passed away about 10 years ago, my dad gave me a plaster skull from uncle sluggo’s collection (which was nice, but possibly dismissive since I don’t think dad would have such a thing as decor). A month or so ago, I was wandering through the house in the dark–checking on the cats or something–and there was the skull, bathed in streaky glow-in-the-dark iridescence. It was a lovely moment because I’d had the skull for years, but didn’t know it’s secret until then, and it gave me a feeling of connection with uncle sluggo, who may have been the last person to know the skull’s secret before me. Scary/cool … is that piece one of yours, V? Guilty as charged. It also gives away my secret identity 😉 I made it as part of a pair to go over the nightstands. Fortunately, reading house-selling books has alerted me to the fact that I should probably take these down before we try to sell the house. Gorgeous, V, congrats! Sadly, I gotta go along with those books, they know whereof they speak … Just do what I do: Look upon creating a house-selling look as a project. Although it involves using parts of your brain you might not use ordinarily, it can be fun getting positive feedback for toning it down. Good luck! I’ve never been a skull fan either, but I sure like the Custom Terrarium with Raccoon Skull. I can’t wait to see what you come up with. Hope you post photos of your creations. Halloween isn’t as big here in CR as it was in Texas, so not much in the way of decorations. Christmas on the other hand is huge.